1. Gather your materials. 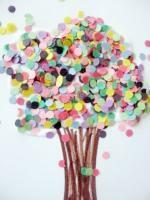 You will need a piece of white paper, one full piece of construction paper in the color of your choice, a whole bunch of scrap coloured paper, a brown marker, glue, and a hole punch. 2. Start by punching out tons of holes, keeping all of them. 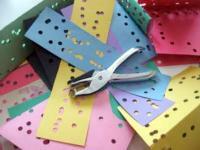 You can do this over a week, allowing children to work out their little hands using the hole punch. 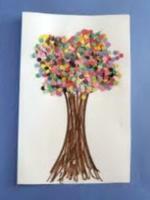 You may also have them choose the color of the paper and you can punch the holes if they are unable to do it. You need a lot! 3. 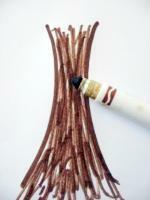 Draw a tree trunk with your brown marker. 4. Add a lot of glue at the top of the trunk. 5. Add your punched-out holes. 6. 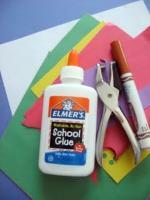 Let dry and glue onto the construction paper for a frame. has been teaching young children in various capacities since 1993. She started as a day camp leader in high school, taught various preschool programs at community centers through university, worked as a tutor while pursuing a second degree in elementary education, and most recently worked as a director and preschool teacher before becoming a full time mom. Now that she is at home she keeps one foot in education while sharing that side of her life with her son and the results have been amazing.